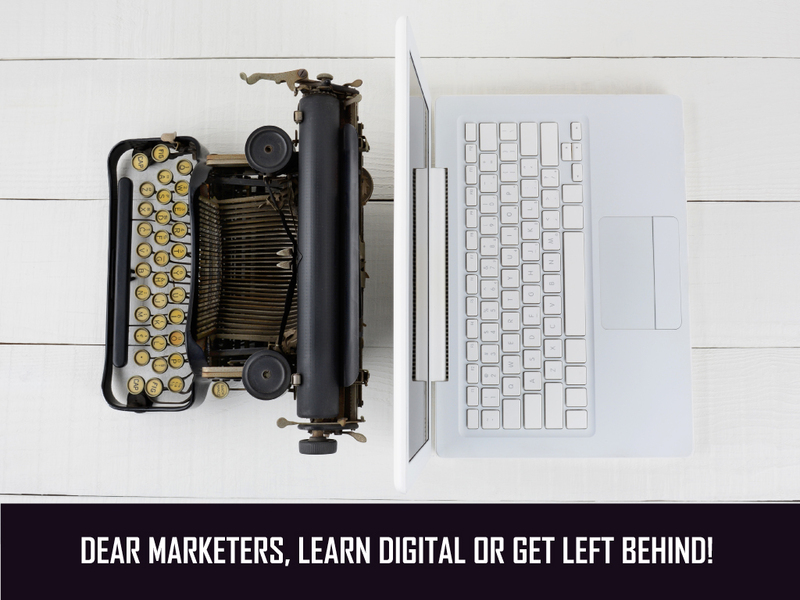 Makina Marketing Group / Business / Dear Marketers: Learn Digital…or Get Left Behind! Dear Marketers: Learn Digital…or Get Left Behind! I’m about to age myself here…I’ve been working in the marketing industry for more than 15 years. Let’s just say when I started out, the most common ways to advertise were through the ‘big five’: newspaper, radio, television, direct mail and outdoor. The extent of ‘digital advertising’ was telling clients they needed a website. The websites we designed were pretty limited with table style layouts, annoying flash introductions, slow loading times and lots of content. Well, I have bad news, my friends. To be blunt, you could be pushed into early retirement from your marketing position very soon if you refuse to adapt! And if you’re a business owner or executive, if you turn a blind eye to the massive changes in marketing, you will have a hard time keeping up with your competitors. No, I don’t think you need to go back to school for another diploma or degree to get a handle on this stuff. But I do think you need to push yourself to start checking out the major digital players. Instead of resisting, it’s time to embrace digital and social media marketing. Make yourself present online, tinker around and get to know what’s going on in the digital world. Instead of saying “I hate Facebook, it’s creepy” how about taking a few minutes to look at businesses or brands you like, or check out what your competitors are doing. You may be pleasantly surprised that it’s no longer just people saying what they ate for breakfast, or how many times they worked out today! There is actually some really good stuff being pushed out on Facebook that is worth checking out. Or, maybe login to Twitter and follow a few people or businesses to see what they are up to and what they are sharing. If the leaders of countries and huge corporations are on Twitter, shouldn’t you be, especially if you’re a marketer? Or give Instagram a try, follow your favorite brands to see what kind of photos and content they are putting out online. A few other ideas…perhaps read a few blogs from industry experts on topics that you’re interested in; take some courses (there are so many free courses and tools online to give you the basics on any platform); or talk with your colleagues about what they’re doing to stay relevant in the digital marketing world! Don’t be afraid to try things out. Remember, you won’t break the internet by exploring around to see how things are working. You don’t have to jump all in right away, but it’s important to stay open-minded. The bottom line is, as veteran marketers, we all have a substantial amount of experience in the marketing industry – experience that is definitely not obsolete. We have knowledge and hands-on skills that newcomers to the industry do not have – imagine how much more valuable you’ll become as a marketer if you choose to diversify your skillset by embracing digital marketing whole-heartedly! Have you found yourself resistant to digital and social media marketing? Leave a comment to tell me what you think! Edmonton Marketing, Communications and Social Media Management. Proofreading saves time, money & grey hairs! 3 Things You’re Doing on Social Media That You Need to Stop!